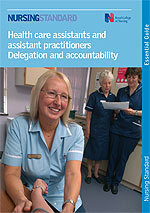 The purpose of this guide is to address some of the key issues regarding the delegation of tasks to health care assistants (HCAs). The guide focuses on HCAs, APs and registered nurses (RNs) and should be useful for all nurses, APs and HCAs, regardless of their particular workplace. It is usually nurses who take the lead in delegating clinical care to HCAs, but the issues that will be discussed are also relevant to other healthcare professionals who may delegate care to APs or HCAs.